The hazards of Dhaka street life are well-known, not least those related to the activities of its less desirable inhabitants. In recent years, these have included the “molom party” (“ointment muggers”), who rub a strange substance into people's eyes that causes temporary blindness, and the “oggan party”, who specialise in slipping a sedative into almost any edible item. An acquaintance of mine was recently mugged after he had purchased a daab (tender coconut) at a roadside stall. After drinking the contents, he passed out, and when he came to, he realised that he had been robbed. The muggers had apparently injected the sedative into the coconut! At the lower end of the criminal food chain, there are a number of less dangerous but distinctly unpleasant hustlers wandering around the city. One racket involves someone (often a woman) approaching you holding a steel container, similar to a carrier box for food. This person will then ask you for money, depending on your apparent level of affluence and if you refuse, will threaten to release the snake that is held in the container. A friend of mine, Adiba, was getting off her rickshaw when she was approached by a middle-aged woman who asked her for 5 takas, the amount that the rickshawallah had just handed her as change. The woman threateningly brandished the steel container in her hand, thrusting it forward as she made her demands. Being understandably rattled, Adiba gave her the money. But the woman also realised from the way she was looking at the box that she was quite scared. Another equally unpleasant tactic is one being adopted by the “goo Baba”. The name gives away the approach that is taken by these ruffians. They usually walk around holding a handful of human excrement, and will threaten to fling it at you if you don't give them money (or even if you give them insufficient amounts of money). CNG and rickshaw users are particularly vulnerable to these forms of extraction, but those blessed with nerves of steel or a capacity for quick thinking have been known to get the better of them. A friend of a friend, Kafi, saw what one of these men was up to when he approached their CNG. Being an architectural student and therefore well-equipped with a long tube holding his blueprints, he waved it threateningly at the guy and told him to get lost. It worked! Even more impressive was Risal who looked the approaching Goo Baba straight in the eye and said, “Yeah, so what do YOU think you're up to?” After a brief moment when they stood eyeball to eyeball, the would-be feacal-thrower backed down and disappeared into a nearby crowd. But perhaps most worthy of the “cool dude” title was an acquaintance of mine, who was standing outside a restaurant when he was approached by a woman carrying one of those dreaded steel containers. When she asked him for ten takas, he replied "Why should I give you money?" In response, she threatened to unleash her snake from the steel container. Not to be scared easily, he countered "Okay, show me the snake". Taking off the lid, she displayed the contents of the container to him. There was indeed a snake in there! But our hero did not back down. Shrugging his shoulders, he dared her to do her worst. When I asked him about it later, he said "Yes, there was a snake in there. But it was a small one, black with stripes on it. Besides, it looked very lethargic. It was probably drugged, otherwise they would risk getting bitten themselves"! I have to say, confronted with a snake (drugged or otherwise), I could only ever dream of exhibiting that degree of super-coolness - something I was reminded of a few days later when I noticed a group of colourfully dressed women walking along the pavement in Mohakhali. They were balancing large baskets on their heads, with an enviable degree of ease. I didn't know what was in the baskets, but there was something about the way that they walked which set them apart from other women on the street. Perhaps it was the clothing (although they all wore saris, they seemed to have worn them in a different way) or perhaps it was the confidence with which they strode through the crowd. Anyway, I pointed them out to my partner in crime and the person with whom I spend several hours a day - our driver, Shahjahan. "Don't you know who they are, Apa?" he asked me excitedly. "They are women belonging to the snake charmers' community - and they are carrying the snakes in those baskets on their heads..." That was definitely more information than I needed, but it certainly explained why they seemed so confident! 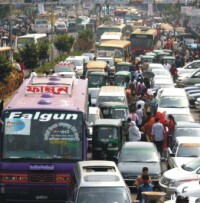 For those fortunate enough to escape the notice of these more exotic denizens of Dhaka, the day to day hazards of reckless driving, traffic noise and air pollution are more than enough to ensure that none but the most hardy (or criminally insane!) would spend any more time than absolutely essential on the city streets. But lest I end up sounding too negative, let me hasten to say that sometimes a hero or two has also been known to emerge from these very streets. It might be an everyday hero like Shahjahan who recently intervened in a dispute that had absolutely nothing to do with him, where a policeman was urging the driver of a taxicab and a private car who had suffered a literal close encounter to sort out their argument amicably. The accident had in fact been the fault of the taxi driver, and the private car was determined to sic a case on the errant cab driver. It was only after Shahjahan took the private car's driver aside and explained to the youth that since he didn't have a licence (! ), it would be best to let the matter go, that calmer counsel finally prevailed! If more people took this approach, rather than the common “Look, there's a scene taking place Let's watch the fun!” school of thought, then perhaps the city streets would be more pleasant to traverse. But I have to say that the most conspicuous case of gallantry I have recently come across concerns the experience of a friend of mine who works as a paramedic in a large hospital. Shuma was trying to take a rickshaw to a location a few streets away from the hospital, where the normal fare was five takas. For some reason, the rickshawallahs at the nearby stand decided to give her a hard time. The first one asked for the rather unreasonable sum of twelve takas, which she refused, while the second driver smirkingly agreed to take her there for eight takas. However, once they reached her destination and she had handed the rickshawallah a ten taka note, he refused to give her any change back, instead declaring in a hectoring tone that “People who ride in rickshaws should make sure that they have change”. Surely the same thing can even more truly be said of people who drive rickshaws! As Shuma stared at him dumbfounded, a man suddenly walked up to him and said “Hey you! I was in your rickshaw yesterday, and I didn't have change either. I didn't hear you lecturing me about what kind of money I should be carrying! So why are you being so rude to her? !” And with that, he took the ten taka note out of the rickshaw driver's hand and went to a nearby shop, returning with eight takas in change and a purchase of four sweets, which he handed to Shuma. Now it was the rickshawwalla's turn to be speechless...!